Yesterday’s weak candle on the euro vs dollar daily chart was duly confirmed today with the currency pair falling once again. One may, of course, question as to why yesterday’s candle could be considered weak and how we could have benefited in today’s trading? And the answer is twofold: firstly yesterday’s candle provided us with a bearish engulfing signal with the outer bounds of the candle “engulfing” that of the previous day. Secondly, the euro vs dollar attempted to rise but found resistance from the 9 day moving average and closed with a deep upper wick both suggestive of a market with bearish tendencies. 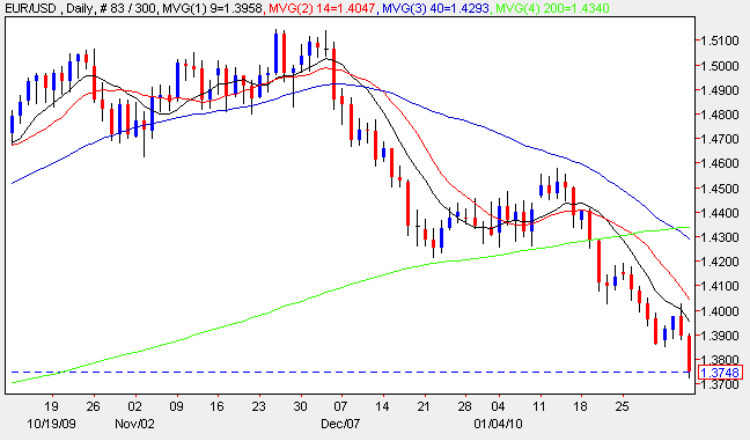 Moreover, given the already bearish technical picture painted by our three shorter term moving averages all pointing sharply lower and, coupled with the break below the 200 day moving average which occurred some time ago, it is not unreasonable to assume therefore that the longer term picture remains negative as well. We are now at a critical technical level of USD1.3750 and approaching USD1.3700 which could provide either a pause point or a platform for a minor rally given that we have some secondary congestion in this price zone so we could expect to see a short squeeze in due course. Longer term should this price point be breached, as expected, then expect a much deeper fall, possibly to re test support in the USD1.3250 and in the medium term even as far down as USD1.2500 providing us with plenty of longer term trading opportunities in the euro vs dollar. From a fundamental perspective today, of course, was all about the ECB bank rate which was kept on hold at 1.% as expected, and ongoing problems with Greek debt problems. Greece is continuing to cause concern in Europe and forcing the ECB to refrain from unwinding further emergency lending measures as a result and it is also putting at risk the entire euro experiment. Indeed Jean Claude Trichet even indicated today that he proposes to wait for new growth and inflation figures in March 2010 before deciding whether to increase the withdrawal of measures used to combat the current financial crisis which has been exacerbated by the debt problems of the Club Med members (Portugal, Italy, Greece & Spain). There was little in the ECB statement today at their monthly press conference to indicate that there would be any change in the current monetary policy and the overall conclusion by the markets was simply that interest rates are likely to be on hold for some time to come and we are unlikely to see any increase before the end of 2010 or, possibly, the middle of 2011. Meanwhile in the US the unemployment claims came in worse than expected at 480k – higher than the forecast of 461k, but this failed to dent the current dollar positive sentiment evident at present. Tomorrow, of course, is non farm payroll and should the data reflect a positive picture (as suggested by the ADP numbers on Wednesday) then we could see a further surge on the dollar index with the eurodollar falling as a result.